To tune ADF application, we need to know exactly what is the reason for performance bottleneck. In Red Samurai we are helping our customer to be happy with ADF. How we do that? Yes - hard quality work (and no bla bla talking) is one of the most important things. 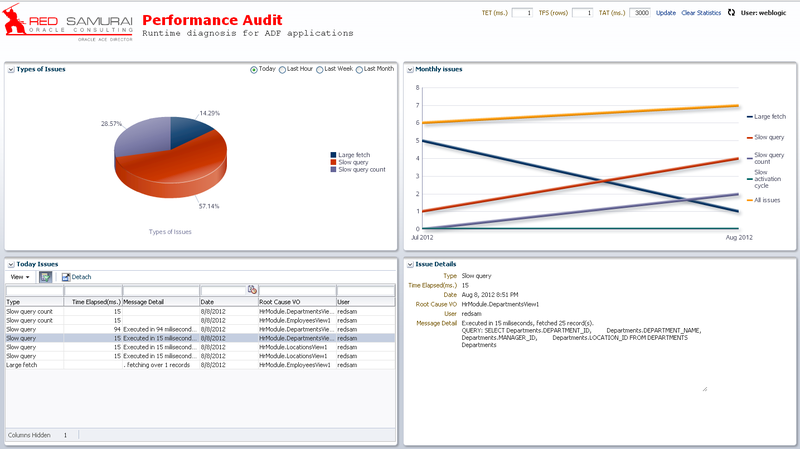 But also we use tools - one of such tools is in house developed ADF Runtime Performance Audit tool. Before blaming ADF is slow, make sure to check the way data is retrieved from DB, also SQL execution performance. I agree, its not always easy to monitor DB/SQL performance for ADF applications. This is the main reason we have developed this tool. Our tool splits into two parts - Audit Engine (6 KB JAR file) and Performance Audit Dashboard. Customer application needs to include only Audit Engine, the rest happens as magic - information about slow SQL starts to come to dashboard automatically. Tool is universal and runs in development, test and production environments. 1. SQL time execution in DB. While SQL executes, ADF waits for response - we want as fast SQL execution as possible. 2. Duplicate SQL execution. Obviously we want to avoid duplicate SQL execution. 3. SQL count query execution. ADF invokes separate SQL count query to estimate rowset size, this may slow down performance for complex queries. 4. Resultset Fetch size. When fetching lots of records from DB, ADF is using more memory to create and maintain rowset, this potentially slows down application. 5. Passivation/Activation time. One of the slowest operations - need to monitor and avoid as much as possible. Details section displays more detailed info, such as SQL query or complete info about large rowset fetch. There is option to change audit parameters on the fly. 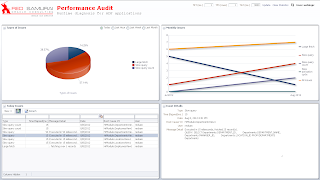 Red Samurai Performance Audit is available free of charge (existing/future Red Samurai customers). it will be so useful.. Can I get some link to download this? Right now we distribute it for Red Samurai customers/future customers. No public availability yet. If it's not a secret how do you intercept SQL statements issued by ADF? In the past I used such proxy jdbc driver tools as p6spy and log4jdbc. Do you use a similar tool or some kind of proprietary mechanism? We are using native ADF BC API (View Object implementation classes), this allows to track natively in ADF BC query execution time (which usually is longer than JDBC execution time) - there is added time to construct rowset, etc. This allows to track ADF performance more realistically. Is this available to public yet? You mean customers who buy this tool or customers for whom you build ADF applications? Those customers for whom we build ADF apps, this tool is installed as a bonus ! How to buy this tool separately? We give it for free, but only in those projects where we are involved. We dont sell it separately. As it not available to buy separately. Can you give guild line how you implemented this. How you storing data? (file/MDS/DB directly). and If its just simple logging , then any best mechanism to retrieve and store data. I'm very sorry, but we are sharing this kind of information only with our customers.